If you practice catch and release as much as we do at Fish The Fly I am sure you have asked yourself a few times, What Does My Trout Weigh? With the practice of catch and release, it is often not a good idea to weigh the fish or keep it out of the water for too long. Which is why Fish The Fly has made this Trout conversion page. 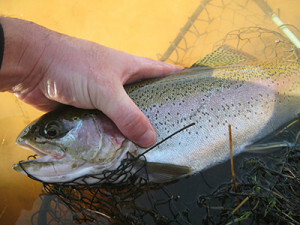 You can find out the weight of your trout caught by measuring it instead of weighing or killing the fish. This is a very accurate trout conversion table, which can be seen below, and calculates centimeters into kilograms for you. This South African Trout weight converter/calculator will give you a general idea of what your fish weighs. Fish The Fly thought we would share some information we have developed, with a bit of research, a fairly accurate trout conversion table which gauges and estimates the weight of a Trout from its measurements, similar to how the SASAA and ORI tables work in saltwater angling. Fish The Fly has adapted and played around with the information we gathered and converted all of it for use in South African waters. This table is generally more accurate for “wild” Rainbow Trout, but give or take a few 100 grams and this can be applied to stocked fish, and their weights are very similar to Brown Trout, generally at each length a Brown Trout will be 10 to 60 grams heavier. This conversion table should be used as a general guideline and not as an absolute accurate. For example, I have seen a 72cm Trout that only weighed 4kgs, and I have caught a 39cm fish that weighed slightly over 1kg. Hope it helps, and good luck, hopefully it can give you an accurate reading of your trophy fish!